MERIDIAN, Miss. (AP) — Mississippi’s two U.S. Senate candidates rallied supporters around their themes of conservatism and moderation Sunday as they entered the closing days of their campaigns. The last two years of the Senate term begun by the now-retired Thad Cochran hangs in the balance Tuesday as voters decide between Republican U.S. Sen. Cindy Hyde-Smith and Democrat Mike Espy, a former U.S. secretary of agriculture seeking to become Mississippi’s first black senator since Reconstruction. It’s the last U.S. Senate race to be decided in 2018 and will determine whether Republicans add to their slim majority. Supported by Iowa Republican U.S. Sen. Joni Ernst, Hyde-Smith spoke to Republican stalwarts at a Meridian museum Sunday afternoon. Blocks away in the eastern Mississippi city, Democrat Mike Espy spoke to a mostly African-American crowd at a Masonic lodge. “I’m going to be the senator for everyone,” Espy said. Espy was introduced by Ayanna Pressley, a Massachusetts Democrat who will join Congress next year after unseating an incumbent in the primary. Later Sunday, on a conference call for the Espy campaign, Democratic U.S. Sen. Doug Jones of Alabama told Mississippi voters that Espy could help bridge partisan divides. The events came after President Donald Trump again tweeted support for Hyde-Smith, calling her an “outstanding person” the day before he planned to campaign with her. It will be Trump’s second trip to Mississippi on the senator’s behalf since October. Trump and Hyde-Smith are set to appear together Monday in the northeastern city of Tupelo, best known as the birthplace of Elvis Presley. Then they fly to the Gulf Coast for a rally in Biloxi. Trump tweeted about the race at least twice Sunday. “Mississippi, Vote for @cindyhydesmith on Tuesday. Respected by all. We need her in Washington!. Thanks!” he wrote. Some of the same people who worked on Jones’ campaign in 2017 in Alabama are now working on Espy’s. Jones did what Espy is trying to do — win as a Democrat in a conservative, Republican-dominated state. Jones said he has been “an independent voice for the state of Alabama,” and Espy would be the same for Mississippi. “I need that voice of moderation with me and our caucus,” Jones said. Iowa’s Ernst, meanwhile, emphasized themes including low taxes, a strong economy, higher military spending and stopping migrants from entering the country illegally. “We think it’s a good idea to protect our homeland, don’t you?” Ernst asked. In the final weeks of campaigning, race has become a dominant issue. Espy vows to bring his experience of “diversity” and “inclusion” to the job, qualities he says are lacking in his white Republican opponent. 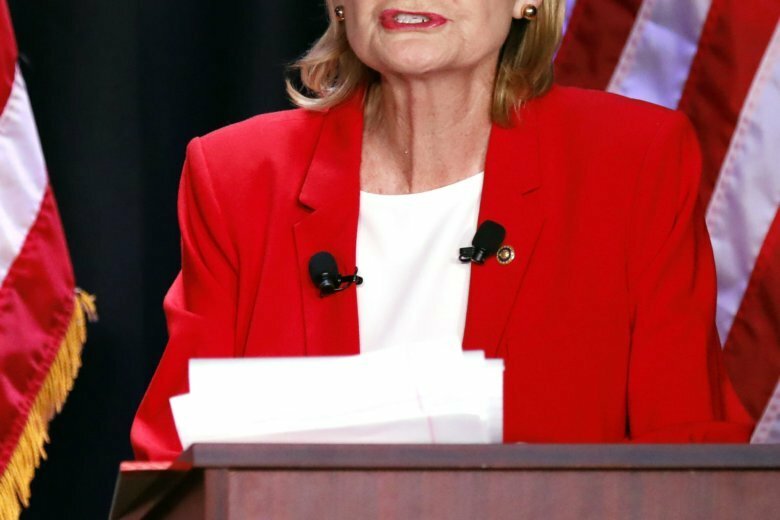 Hyde-Smith has had several stumbles, defending herself after a photograph emerged of her wearing a replica Confederate soldier’s hat, as well as a video of her praising a supporter by saying she would sit on the front row of a public hanging with him. “Ladies and gentlemen, we are not going back,” Espy told supporters, criticizing Hyde-Smith’s apology for the hanging remarks. The race is expected to drive a higher-than-usual turnout for a runoff in Mississippi. More than 43,000 absentee ballots have been requested, and that number could increase as final numbers are tabulated. About 69,000 absentee ballots were requested before the Nov. 6 election, which saw the highest number of votes in any non-presidential election in Mississippi. There’s typically a decrease in ballots cast between the first election and a runoff. Associated Press writer Emily Wagster Pettus contributed from Jackson, Mississippi. For AP’s complete coverage of the U.S. midterm elections: http://apne.ws/APPolitics . Follow Jeff Amy on Twitter at http://twitter.com/jeffamy .